There is no consistent definition of terms that have arisen in the evolution of inertial instruments. This standard is intended to serve as a basic reference for producers and users of such systems, for preparing industry standards, and for the interpretation of published technical reports. Revision Standard - Active - Draft. 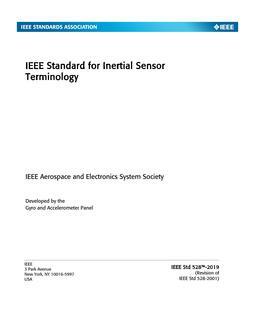 Terms and definitions relating to inertial sensors are presented in this standard. Usage as understood by the inertial sensor community is given preference over general technical usage of the terms herein. The criterion for inclusion of a term and its definition in this standard is usefulness as related to inertial sensor technology.